So, do people actually like the iPad? After months of hype, dozens of reviews, plenty of television promos and an Easter weekend appearance at an Apple store by the high priest of gadgetry himself, Apple CEO Steve Jobs, the company's long-awaited iPad is finally in the hands of consumers. Sales: On Saturday, the day the product was released, Apple says it sold 300,000 iPads. Analysts estimate the company sold between 300,000 to 700,000 of the touch-screen "slate" computers over the weekend. Anticipation: 300,000 iPads is about what analysts expected Apple to sell on opening day. Comparison: The iPhone - which some think is basically a smaller version of the iPad - launched in 2007 as Apple's greatest hit in recent memory. Analysts estimated 200,000 iPhones were sold on the day it debuted, which is a third less than the iPad. The iPhone sold its millionth unit 74 days after it hit the market. Reviews: The mainstream press wrote mostly glowing reviews for the iPad in advance of its release on Saturday. Some consumers have expressed disappointment with their purchases. Others find pros and cons, but many say they really love the device. [Here's a wrap-up of reviews from CNN iReporters]. Mainstream appeal: By some accounts, most of the people who bought iPads already were Apple fans - i.e., nearly three-fourths of them already owned a Mac, according to a Piper Jaffray survey. How the device will fare with people outside the Cult of Mac is a question up for debate. Apps: Apps - or the games, applications and programs that run on a gadget - really made the iPhone sing with consumers, because apps determine what a device can do. More than 1,000 apps have been designed specifically for the iPad's 9.7-inch screen, and the New York Times says developers are rushing to update them now that the device is out. Consumers already have downloaded more than 1 million iPad apps, according to an Apple press release - so that's about three apps per iPad to date. Revolution: Some analysts expect the iPad to revolutionize the area of tablet computing, which Microsoft and others have tried to push on consumers in the past, but with only limited success. 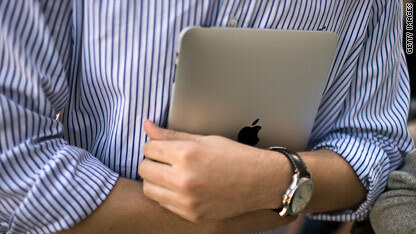 The iPad's success may buoy the entire tablet market, says USA TODAY. The newspaper says once-stale tablets "may be the new hot thing." Debauchery: Finally, if the hackers don't like your gadget, you know you have a problem. But, in what could be read as a good or bad sign for Apple, a video of someone "jailbreaking" the iPad has already surfaced. Have you gotten your hands on an iPad? If so, let us know what you think of it, either by posting a comment below or by submitting a video to this CNN iReport assignment. (You can find other consumer reviews there, too). Also, if you still have questions about what the iPad is and what exactly it does (don't worry, some people in line to buy the device still were unsure of what it was), here are two guides to understanding the iPad, and picking the right one. Apple is so ripoff on this ipad, price it way too high for a divice with limit function. It probably cost them $200 to make this thing and how much they selling it? Is this a big itouch? I got my i Pad on May the 29th and was overjoyed. I am still thrilled and it is so easy for me to see everything. I have an I phone and it is just too small. My grandkids thinks it is awesome as well. Pretty interesting blog you've got here. Thanks the author for it. I like such topics and anything connected to them. I definitely want to read more soon. my daughter has one and it is really a cool device to have. definitely on the luxury side of owning one but i would recommend it to alot of people over 50 that might not need a desktop and just enjoys the option of the internet and all its capabilities. i can't wait to own one myself but will see what happens at the end of this year before i splurge!! I had the liberty of testing this unit. during my testing stages, I found that yes it may be a overgrown ipod. but with apps like Netflix, your movie watching days are now mobile. I had the 64gb 3g version which was short of the amount of space needed to add more songs.. with this test, 8500 songs were added and 23 digital movies from movies I bought at best buy, they give you the digital one as well. I had a over good experience. when the jailbreak came out, I was not sure if I was going to update it, but I gave it a whirl, and d found that alot of apps for the iphone 3g worked without a hitch. The speaker located on the bottom of the ipad wasnt nice, I would prefer the speakers to have more then one outlet. Apple should have thought about thru the display, or evem on the sides, rather then the bottom. The Screen being big, makes it easy for people with bad eye sight to enjoy the perks of road entertainment. my final point of this write up is simple.. does it work for work? does it help you in your everyday office work? does it replace a laptop? does it do the wonders that others have? simple answer to all of them NO.. my next feat will be the blackberry. As of now with the RIM technology, it will be interesting to see what comes out of them. I have seen a new ipad clones out in china.. again, cheap software, horrible graphics, and more issues. can apple improve? Yes they can, but they need people who work everyday with IT to help contribute more to their development. too bad they would not hire the people who really give them a run for their money. the guru's they supposedly have, what do they know?? they work for apple.. duh. is it worth it? nah.... the price should have been 50% lower then they priced it. Not to fear even microsoft is collecting the negative feedback on this apple thing, and be rest assured their programmers are working hard to give Steve something to chew on. I think it looks cool but not practical. it is supposed to be portable - use anywhere. But if you touch the screen accudentially - and that will happen a lit if you are using it "actively", evetrything changes. What good is that? I can't believe everyone buys into this hype. I love love love my ipad. I have only owned laptops, and this work far better for me, and for my job. I am a PC user / web designer who needed to purchase an iPad to research how it would affect web pages and in that department it is a huge dissappointment as it is clearly a retro, back to low resolution 1024 X 768, non multi-tasking, non flash, non USB environment that virtually pulls us back to circa 1998 computing. It is fundamentally tied to the apron strings of "I Tunes" and typically reflects Apple's selfish fascism and uni-dimensional, corner the market on all peripherals and take a piece of every App action mentality. Profitable? of course! so five stars there for their business model. Restricting on individual freedom to interact with other devices? well even their exclusive video out cable for $40 does not actually output to your video recorder or display device... it only outputs authorized "apps" which by the way are tiny fragmented pieces of what used to be called software programs, only now they are so specific as to resemble just one or two features out of a total program. Buying apps is kind of like buying one feature in Photoshop and then purchasing each filter seperately, including the option to SAVE your work 'app'. All in all I cannot wait for ANY legitimate alternative that gives us back the original ideal that computers promised, compatibility, cross platform communication without the I Tunes censor hub and basically just sane, civilized evolutionary features that expand your options not constrain them. The iPad is so retro in so many respects it makes you wonder if Apple is not some kind of government plot to reclaim technology and the Internet from the public. I give it two stars for effort and 5 stars for profitable scam device of 2010. Can't any company in the whole PC world free us from this dictatorship of so called convenience? Same goes for the new iPod by the way... two cameras and it can't even run Skype video chat, I mean hello? I bought one to keep in touch with email and the web on business trips. I like it because it is much smaller and lighter than a laptop and doesn't need 120 VAC every two hours. It is harder to type on the screen than a laptop, and will not write my novel on one, but with instant-on and 3G wireless access I can do things while waiting for a train, at lunch, or as a passenger in a car that I would not have bothered with if I need to take out a laptop. I installed the word processor and spreadsheet .. they work fine but I only rarely use them. Looking for Apps in the app store is time consuming, and when you think "Oh, there should be an App for that," there isn't. As with all Apples of the past, its overpriced and has insufficient memory. I like the long battery life and its good for showing sample pictures, but the available software is primitive and I find its operating system very backward and outdated. The need to use Itunes and constant "synching" is also very, very outdated. Most computers that you will connect to the Ipad have insufficient power through the USB port for charging rapidly. I waited to buy one until multitasking became avaiable. The basic mentality of Steve Jobs is behind the machine where he is smart and you're not. Urgently needs a separate USB port. Impressive post. When will I get the rest information? Great post! It's also interesting that those with the worst writing skills are often the most confident in their writing abilities while more adept writers are more likely to realize their own weaknesses. I see little difference between Left & Right libertarians. As long as it's all voluntary, we speak the same language. Kerry says "Where the responsibility for poverty should lie." Wow, incredible weblog format! How long have you ever been running a blog for? you made blogging look easy. The whole glance of your web site is excellent, as well as the content material! Thanks , I've recently been looking for info approximately this subject for ages and yours is the greatest I've came upon till now. However, what about the bottom line? Are you positive in regards to the source?|What i don't understood is if truth be told how you are now not actually much more well-preferred than you might be right now. You are very intelligent. Hi there, You have performed an incredible job. I'll definitely digg it and individually suggest to my friends. I am sure they'll be benefited from this site. You are truly a good webmaster. The web site loading speed is amazing. It kind of feels that you're doing any unique trick. Also, The contents are masterwork. you've performed a great task on this subject! Wow, wonderful blog format! How lengthy have you ever been running a blog for? you made running a blog glance easy. The total glance of your web site is magnificent, let alone the content! My brother suggested I might like this blog. He was once entirely right. This submit truly made my day. You can not consider just how a lot time I had spent for this info! Thank you! Thanks for every other excellent article. The place else may anyone get that kind of information in such an ideal manner of writing? I've a presentation subsequent week, and I am at the search for such information. hello!,I like your writing very a lot! percentage we be in contact extra about your post on AOL? I need an expert on this space to resolve my problem. Maybe that's you! Taking a look forward to peer you. hey there and thank you for your information ? I have certainly picked up something new from right here. I did alternatively expertise a few technical issues the usage of this site, as I skilled to reload the website many times previous to I may just get it to load properly. I had been brooding about if your web host is OK? No longer that I am complaining, but slow loading instances instances will very frequently impact your placement in google and can damage your high-quality ranking if advertising and marketing with Adwords. Anyway I'm adding this RSS to my e-mail and can look out for a lot more of your respective intriguing content. Make sure you update this once more very soon.. I could not resit commenting. Perfectly written! I enjoy reading youor articles. You really have a wonderful blogs. Keep up the good work. Thank you also for the information! I just added this website to my rss reader, great stuff. Can not get enough! I like this site so much, saved to my bookmarks. "Nostalgia isn't what it used to be." by Peter De Vries. Si después de reiniciar el problema continua, llama al teléfono del Servicio Posventa que aparece en el manual de instrucciones de tu electrodoméstico. Después de ponerte en contacto con el Servicio puede que te pidan que envíes el Indego al Servicio Técnico de Bosch. I write a leave a response when I like a article on a blog or if I have something to contribute to the discussion. Usually it is caused by the passion displayed in the post I browsed. And after this article. I was excited enough to leave a comment 🙂 I actually do have 2 questions for you if it's allright. Could it be just me or do a few of these comments appear as if they are written by brain dead people? 😛 And, if you are posting at other online sites, I would like to follow you. Would you list all of your social pages like your Facebook page, twitter feed, or linkedin profile? Hi there! I simply want to give an enormous thumbs up for the good information you've got here on this post. I will probably be coming back to your blog for extra soon. Hello! I simply wish to give an enormous thumbs up for the good info you could have here on this post. I will be coming again to your blog for more soon.